The young bear is being prepared and conditioned for eventual release back into the wild at a special rehabilitation center in Idaho. It has taken cooperation from three different organizations (i.e. Washington Department of Fish & Wildlife, Idaho Black Bear Rehab, and Lake Tahoe Wildlife Care) in three different Western states to make it possible to return this bear back into the wilds of Washington State. It is a momentous achievement and something that will hopefully be made possible in the future for other injured or orphaned black bears in need of temporary human care or intervention. There are about 100,000 wild black bears in Alaska. Idaho is home to approximately 20,000 black bears and both Washington State and Oregon are home to as many as 30,000 black bears. All four states, which collectively host the largest population of black bears, regionally in the US, continue to permit seasonal harvests of adult bears, along with 24 other states. Although, many black bear cubs starve to death before they even see their first birthday, while others become prey for other bears, and some succumb to natural disasters, there are still a great number of young bears that are orphaned as result of hunting practices nationwide. It is a wonder that so few resources are available for rehabilitating orphaned or injured black bears in the US and in the Pacific Northwest, in particular. If bear cubs receive any intervention, in the best case scenario, they are placed in a captive facility. In the worst case scenario they are left to fend for themselves and typically meet an untimely death as they are often consumed by larger bears or starve to death. More commonly, they are humanely dispatched by local wildlife biologists. According to a recent news article, the Alaska Department of Fish and Game (one of the largest wildlife agencies in the United States), indicated that it is only able to "place two or three black bears in need" in any given year. This year, to their credit, they have placed 8 cubs in the custody of captive facilities. Unfortunately, this number pales in comparison to the number of orphaned cubs in need of placement. When I served as the Curator of Animals at the Alaska Wildlife Conservation Center near Anchorage, we easily received several calls a season for black bear and grizzly bear cubs in need of homes. Another facility also received polar bear cubs in need of placement, which drew national attention. Two reasons black bears are difficult to place is because, like all bear species, they are long lived and because they are not deemed conservation sensitive. So space is an issue, aside from other husbandry needs. Even the individuals representing the most imperiled subspecies from the Southeastern states are making a comeback. Hence, sanctuaries and other facilities are limited in their ability to accommodate new orphaned black bears from any where. These are tough choices to make and unfortunately, as mentioned, many are euthanized. .....  humanely euthanize an animal if placement isn't available or the animal's health is questionable." In the Pacific Northwest, Idaho has a facility dedicated to the rehabilitation of injured or orphaned black bears and Washington State has two such facilities. The Idaho Black Bear Rehab, Inc. in Garden City, Idaho has a facility with staff trained to aide in the "reintroduction" of subadult black bears to the wild. And they have been very successful for over two decades releasing black bears back into the region. "Release only bears that are in excellent physical condition with intact teeth and claws and no handicaps that would reduce their ability to survive in the wild. • Release bears when they are large enough to defend themselves from predators. • Release bears that are genetically compatible with those in the release area. • Release bears when natural food resources are abundant in the release area. • Release only bears who are inclined to avoid people." "Release only bears that are in excellent physical condition with intact teeth and claws and no handicaps that would reduce their ability to survive in the wild. • Release bears when they are large enough to defend themselves from predators. • Release bears that are genetically compatible with those in the release area. • Release bears when natural food resources are abundant in the release area. • Release only bears who are inclined to avoid people." 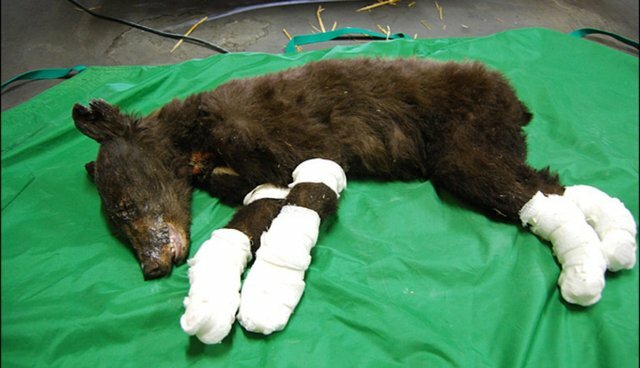 These conditions apply to many situations in which bear cubs become candidates for release when found orphaned or injured in the Pacific Northwest and elsewhere in the United States. Hopefully, more resources will become available to give these sentient animals in need of intervention a second chance at life in the wild.